The Missouri River Bird Observatory (MRBO) hopes that YOU will attend this year’s Audubon Society of Missouri (ASM) Spring Meeting! MRBO is a 501(c)3 non-profit organization dedicated to the conservation of Missouri’s migratory and resident birds through scientific research and monitoring, community outreach, and education. This spring MRBO will be hosting the ASM meeting on May 4th– 6th at MRBO headquarters in Arrow Rock. 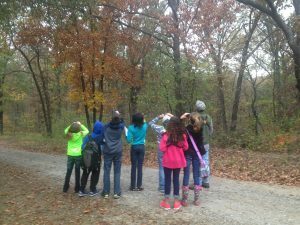 The main themes of this year’s meeting are youth engagement in birding and conservation; these themes come together in the formation of the Missouri Young Birders Club (MYBC). The aim is to bring young people from all over the state together to enjoy birds and further develop their knowledge of conservation. The MYBC will be a part of the Young Birders Network (YBN), which was formed by the Ohio Young Birders Club in partnership with Cornell Lab of Ornithology. The YBN aims to provide resources for young birders to connect and learn, while giving their adult advocates resources for encouragement and support. Thirty-three other states in the U.S. have young birders clubs and it is surprising that Missouri isn’t yet one of them. Missouri has a very special conservation community, along with unique and beautiful natural communities – wouldn’t it be great to provide opportunities for young birders to engage with both? If you think yes, then make sure attend this year’s meeting and read how you can help below! Meeting Attendance: Audubon Chapters and individuals are encouraged to sponsor a young person to attend this meeting (registration fee, lodging, and travel costs). ASM and MRBO will cover the costs of the Saturday morning Missouri River Pelagic field trip for up to five youth who will assist with the Young Birders Club workshop on Saturday afternoon. Presentations: For this meeting we will have a few 10–15 minute presentations given by Missouri young birders about their experiences with birding and why they bird. The presentations will be Friday evening in the Arrow Rock State Historic Site Auditorium after the opening social. In thanks for their presentation, their meeting registration fee will be waived. If you know a young birder who would be interested in presenting, let us know. Afternoon Workshop: The spirit of the meeting is also reflected in supporting the young birding community through formation of the Missouri Young Birders Club (MYBC). There will be a workshop focusing on developing the MYBC on Saturday May 5th from 1:30–3:30 p.m. We fully anticipate the direction and vision of the club to be formed by its youth members. An addition to discussion and distribution of materials, we will be planning regional field trips throughout the state and soliciting comments on web and social media design. Please attend!